At Haverhill Farm, we strive to provide individual attention to both horse and rider. Whether you are looking for the best of care at an affordable price for your horse, or individual attention for your rider learning about horses, Haverhill is the place for you! All of our trainers are college educated or certified instructing adults and stress to our riders the importance of education. School first, horses second! Jessica, trainer and scheduler, is also a teacher and is an advocate of individualized learning for both horse and rider which has been adopted in the Haverhill Lesson and Training Program. We believe in private and semi-private instruction, and our group lessons are scheduled with four riders. Smaller groups and individual attention fosters growth and learning for all ages and riding levels. To set up a lesson, email hhfjas@gmail.com. To visit the farm, please contact us to set up an appointment. Our new facility has twenty eight stalls, indoor and outdoor arenas, and small trails. We're located just minutes from Glen Allen and Short Pump, with easy access to 64, 295, 288 and 95. We are happy to help you find your new best friend! Please see your trainer for details if you are interested in leasing or purchasing a horse. There is a 10% commission payable to the trainer for all sales and purchases of horses. We offer riding lessons and school horses to suit every skill level and goal. Whether you are just starting out and would like to learn to ride, or are interested in advanced lessons or showing, we welcome you to schedule a lesson at Haverhill. We are proud supporters of IEA and IHSA programs! 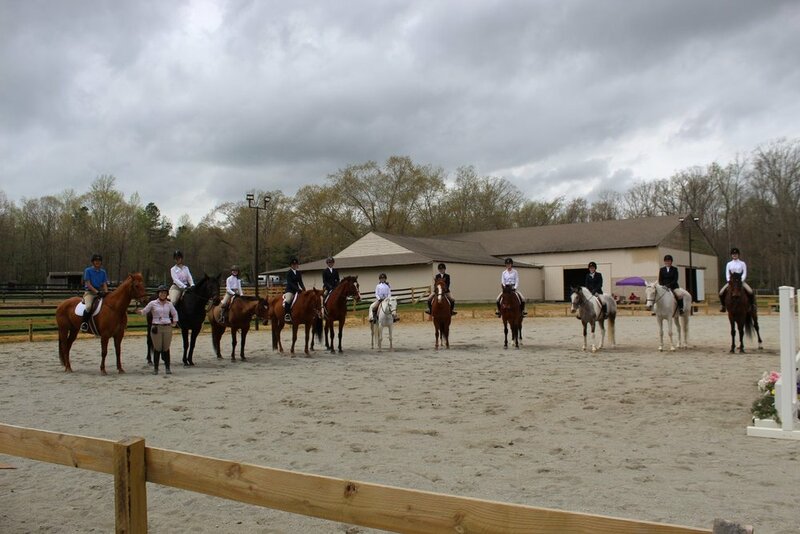 Our IEA team caters to middle school and high school students and we are home to The University of Richmond's IHSA team. Haverhill Equestrian invites all children who want to learn more about riding and horse care to join us for camp this summer near Richmond. We keep camp enrollment small with an average of 10 kids so our trainers can provide each student with individualized instruction. Showing can be a fun and important part of riding as it helps a rider set and achieve personal goals. No matter a rider’s level of experience or participation in Haverhill programs (owning, leasing, or just taking lessons), the trainers at Haverhill can help everyone meet personal show goals.